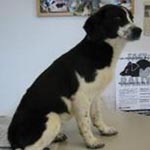 Panda is a young female English Pointer mix. She is very tiny and puppy-like. She seems to be no more than 4 or 5 months old. 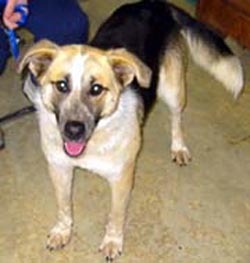 She is spayed, up to date on shots and microchipped thanks to PAWS in Paris, KY. This adorable dog is Taffy. She was found by a Vet Tech, and brought to us. She is about 1 year old (as of 3/31) and weighs about 15 - 20 lbs. She is a real doll with a cute personality. She is well behaved, walks well on the leash and quietly rides in the car. She is energetic, but not to the point of being hyper. She is a social dog who really enjoys people. She is very tolerant and will be good with kids. She is also just fine with other dogs. 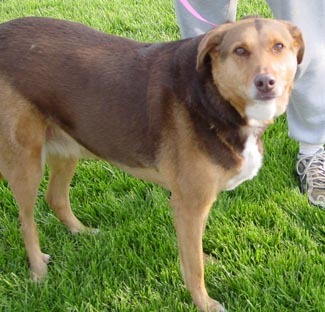 If you adopt Taffy, she is guaranteed to add some sweetness to your life! 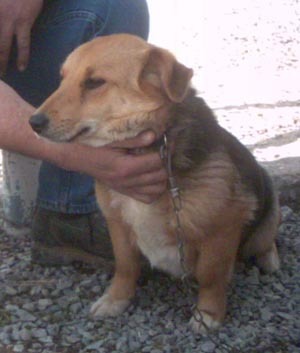 Taffy has been transferred through PAWS in Paris, KY. This charming puppy is Waldo. He is one of Princess's puppies. 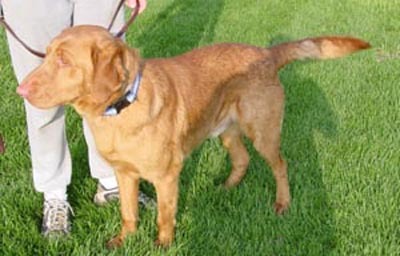 His Mom is a Beagle/Springer Spaniel mix and we think Dad is a Labrador Retriever. He is about 14 weeks old now. Waldo is very cute and has the sweetest face. His personality matches his looks too! 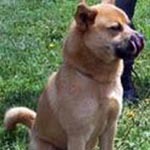 He is happy, affectionate and people oriented. 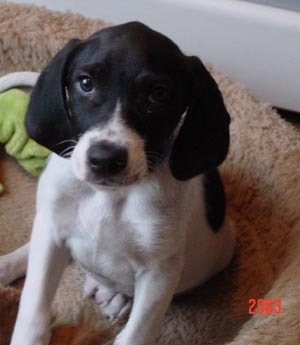 He is a playful, energetic puppy who is curious. Waldo will be a super companion. All he needs is a home! This attentive girl is Gumpette. She is a German Shepherd mix who is 6 months old (as of 3/27). She is a very well behaved puppy for her age. She is friendly, bubbly and affectionate. She gets along with other dogs and likes to run and play. She is a smart girl and will train very well. She is very pretty too! Gumpette has beauty and brains - all she needs now is a home! Ivan came to us as a stray. He is a small dog and only weighs around 25 lbs. Ivan is a very friendly dog who is people oriented. He has a fun loving and affectionate nature. Ivan is friendly and outgoing with everyone. He is well behaved and walks on a leash without pulling. He really is a very nice dog and will be a great companion. 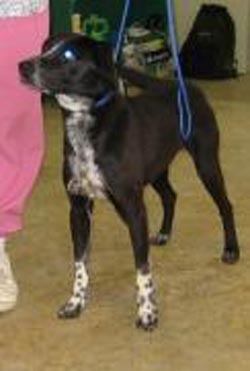 He is neutered, up to date on shots and microchipped thanks to PAWS in Paris, KY. This little guy is Tuffy. He is one of Princess's puppies and is ready for a home now. 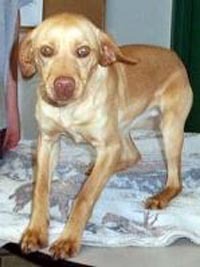 His Mom is a Beagle/Springer Spaniel mix, and we think Dad was a Labrador Retriever. Tuffy is 9 - 10 weeks old now. We can tell you Tuffy doesn't quite live up to his name. There is not much toughness in this puppy since all he wants is love and attention. He'll show his tuff side by rolling over for a belly rub or giving kisses. He is playful and happy. Tuffy will be a great companion. Ozzie is a female Aussie mix who is an awesome dog, already house trained and well cared for in her previous life, but suddenly homeless. She was given up as a result of divorce. The husband got the house, but didn't want the dog. She is just a love with everybody she meets and a real looker too. 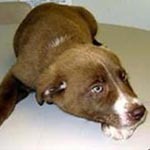 Beau is a 9 month old lab/husky male who was turned in by his owner who was moving. He is housebroken. This jolly dog is Buddy. We believe he is around 1 yr old. Buddy is very, very friendly and enjoys everyone he meets. To Buddy, no one is a stranger! 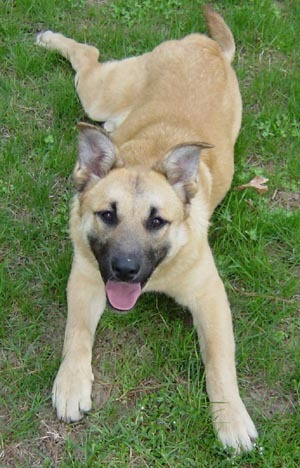 He is a pushover with other dogs, including the puppies. He knows sit and crate and goes in willingly. He is energetic outside, but good in the house and not hyper. He doesn't jump up. He enjoys playing and loves to be chased by the little dogs. It's like he's laughing all the way. Curtis is a six month old blue eyed beagle. 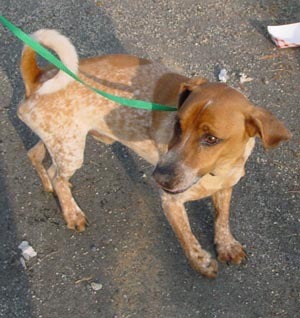 He loves everybody and is quite an affectionate dog who loves to sit in your lap. He was recently neutered and fostered with other dogs. He is ready for a permanent home. Must be able to spend the hours with a dog this young. This is Cinder, and you can probably guess how he got her name. 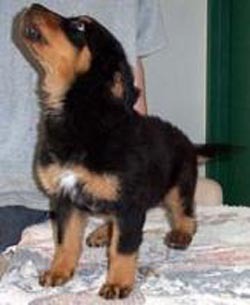 He is a bouncy, playful, wiggly puppy who is just full of energy. He is happy around people and other dogs. He is a little doll and is ready to squirm his way into your heart. Hi there! I am trying to give my best imitation of a southern drawl. I hear you have to kinda curl your lips, but I just don't think I get it! Somehow, I ended up homeless and all alone. Fortunately, someone found me and brought me to the nice folks at P.A.W.S. I am a rambunctious girl who is full of energy and playfulness. I am happy and just love to explore. I enjoy finding things! You can see that I am very, very cute! 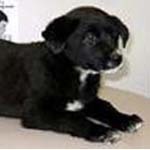 Jimmy is a 3 or 4 month old male lab mix puppy. He is very playful and active. Cute as a button and as calm as can be. This is Noodle. She was adopted out of a shelter as a pup and then tied outside day and night. This sweet little girl deserves better. 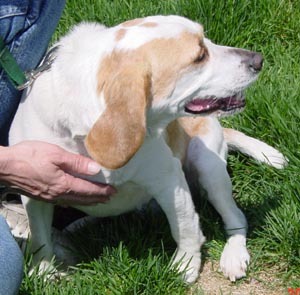 She is quiet and sweet, just a delight for any family. 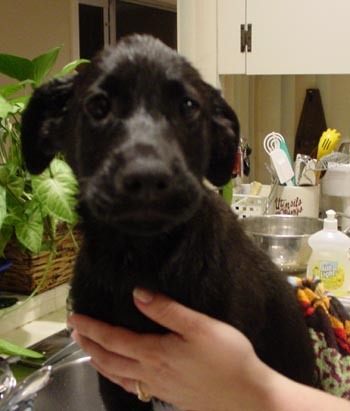 Sparky is a 3 month old lab male who already loves the water. He is playful and typical of a lab pup. He is just as sweet and lovable as any pup we've seen. Please be a stay at home and if you are a family have gentle children and a fenced in yard (if young kids). 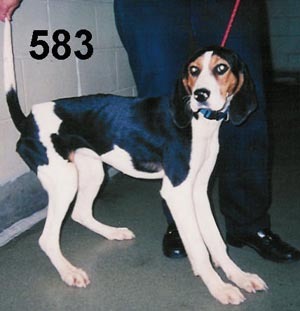 He will need obedience training and lots of TLC. Adopted. 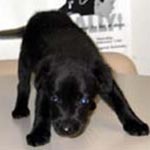 Randy is a 4.5 month old lab male who is very active and playful. He loves playing with other dogs and is just adorable. Sorry for the bad picture. He is already microchipped and supposed to be housebroken.Please be a stay at home and have gentle children and a fenced in yard (if young kids). 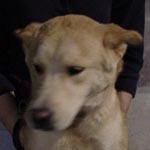 He will need obedience training and lots of TLC. Adopted. Stanley and Butch are two male shepherd pups, about 6-8 months old. They will be placed separately. These pups are GORGEOUS but may turn some folks off as they have some black on their tongue, indicating they may be mixed with some Chow. They are so beautiful and have sweet personalites. 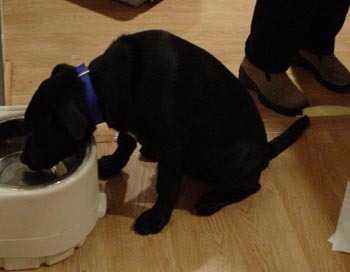 Nevertheless, each will need lots of attention and training. Buddy Beagle was from a litter of pups we placed 3 years ago. He just came back because of family difficulties. Thank God a nice retired couple came along who have grandchildren and Buddy is good with kids so off he went and is now being much doted on. Lion, relaxing in his bed! 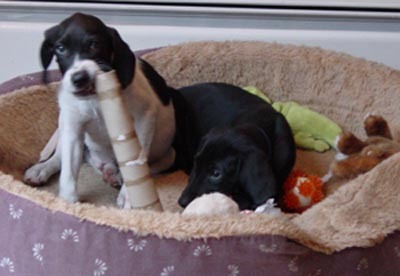 These puppies just got rescued from a MD shelter. They are sweet and very needy. Please be a stay at home and have gentle children and a fenced in yard (if young kids). They will need obedience training and lots of TLC. Under 10 lbs. currently as they are babies. Oliver is an 18 month old neutered male Bichon who just came to us as a result of his owner going into a nursing home. 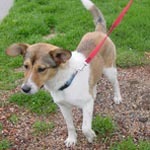 He is used to having someone around so a retiree with energy would be great as he is a peppy little guy. 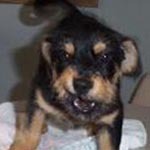 Also, he might do best as an only dog as he dominates the other two bichons in his foster home. He is wonderful, though, and very adoptable. He weighs about 14 lbs. * She is an amazing dog. Very smart and intelligent. She knows basic commands: sit, down, and come. We are working on stay. * She is very loyal. She quickly bonded with me and will most likely want one person she can bond with. She is friendly to everyone she meets and loves attention from all but she will most likely develop a deep bond with whomever spends the most time with her. And don't get me wrong she will love having a whole family to fawn over her. * She is totally housebroken and sleeps well in a crate (in your bedroom) at night. * I have 2 cats and she is very curious about them but totally repsectful. My older cat will not tolerate any "nonsense" so Honeycomb steers clear of him. She will try and eat their cat food if given the opportunity. * She loves to play (and retrieve) ball in the yard. 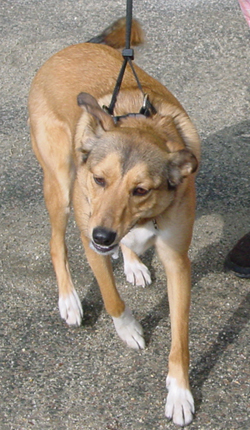 She loves to go for walks and is very easy on leash (no pulling at all and stays with you). * Inside she is well behaved. She will follow you from room to room but can also entertain herself with her toys. She does love to play with her toys, particularly her Kong. * She seems interested in meeting all dogs we come across. Friendly, curious and alert. She was submissive to an aggressive dog we came across but I think if cornered she would stand her own. * My only concern about her forever home is that she should not be left alone unattended outside. I have a 6 ft. fenced in backyard and just went to get the mail at the end of the driveway. She tried desparately to get out and follow me. She couldn't scale a 6 ft. fence but tried to get under it where there was a small gap of 2-3". I live on a busy road and worry about her getting into traffic in an attempt to be with "her person". She is in no way an "escape artist" but motivated to be with you. So you need to be aware and very careful about leaving her unsupervised. * Also you should know that given she is incredibly smart and agile should would be an incredible agility dog. If you aren't interested in that you should find ways to utilize her mind. I am constantly trying to challenge her problem solving abilities. She enjoys the work and loves the praise. 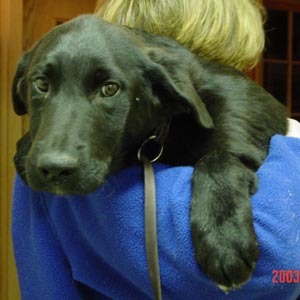 Iris, the female pup, is a real sweet dog who loves to be held. She's also very playful and loves soft squeaky toys. She's about as nice a pup as you'll ever find. She's crate trained and will need work on house breaking. Meet Tacoma! An absolutely handsome dog! 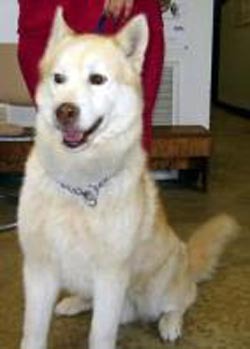 Tacoma is a purebred Husky who is around 1 yr old (as of 4/1). He is so striking! He also has a fabulous disposition. Of all the Huskies we have seen, Tacoma is the best disposition wise. He is very playful and friendly. He is fine with other dogs too and has not shown cat aggression tendencies. He already knows some basic obedience commands and seems willing to elarn more. The only problem we have with Tacoma is that he is Heartworm positive. We are going to treat him because he is so wonderful. Tacoma will reward you with love and loyalty. Please give him a chance. Adoption in progress with foster home. 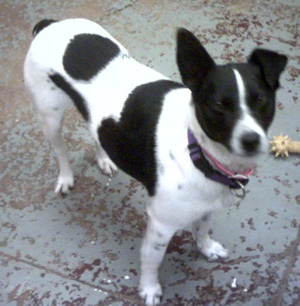 Gidget is a tiny Jack Russell Terrier female who is as cute as they come and very sweet with people. She is just a little doll, a small wind up toy of a dog at less than 10 lbs. Her one vice is that she hates cats, so no small critters for her household. She needs a responsible owner who will train her on "leave it" and "drop it". She's is much cuter even than her picture. A perfect condo-sized dog. 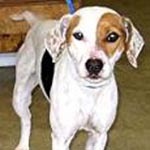 Millie is an 8 month old Tree Walker hound mix. She is current onshots. spayed and a real sweet dog. 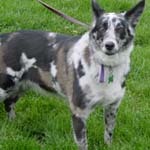 She is very sweet, friendly get along with other dogs. Coming this weekend. Went to another rescue in MD. Sorry. 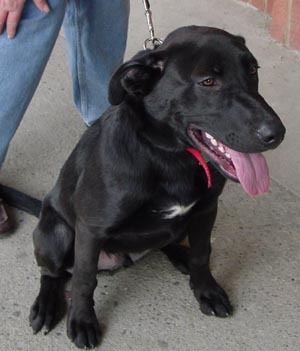 Missy is a gorgeous black labby girl who came to us from a shelter in Ohio where she was about to be put to sleep. She was diagnosed with heart worm and was treated by Save A Dog. 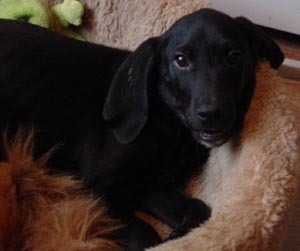 She will need to be kep quiet for a few weeks after her second heart worm treatment. 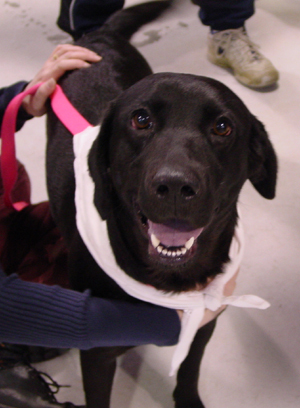 She is a calm, even tempered dog who will need a quiet environment for another month while she undergoes her second treatment. 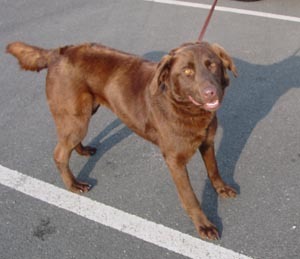 She would make a nice family dog as she's so good natured.She weighs about 50-55 lbs. 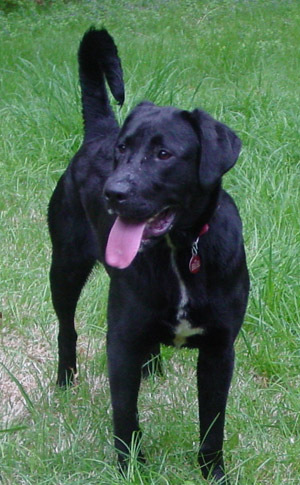 Bocephus is a young, energetic lab who loves everybody. He's just a large goofy lab. He's great with kids. He was really good with some special needs kids he met. One of them fell on him and he licked him all over. That's why we're taking him. He will chase cats, so we better not put him with cats. 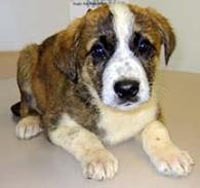 Here's his story: He was brought to the KY shelter by his human. They let him outside on their farm, and Bocephus kept roaming the countryside with his doggie friend Hank. 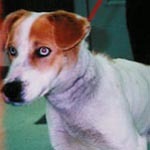 This wasn't safe for him, so we was brought to PAWS in Paris, KY and now he is with us. 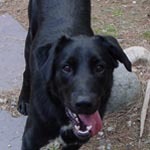 He is a Labrador Retriever mix who has just turn a year on 5/21. He is a very friendly, social dog. Just loves people. He just needs a little training. Hegets along great with other dogs. 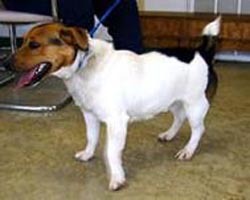 He was kept inside some too, and may be housetrained. Please come meet this guy - he is ready for a forever home! Adopted! Free dog bed to the person who adopts Bocephus. 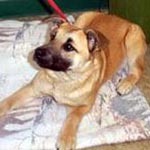 Minnie Mouse, so named for her ears and look, is a 5 to 7 month old female Shepherd mix. She looks a little like a Manchester Terrier. 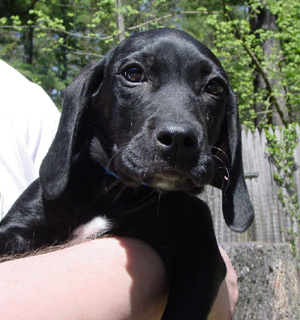 She's very puppy-like and playful, not too demanding, just full of love and fun. She is just lovely and as sweet as can be. She weighs about 20 lbs. 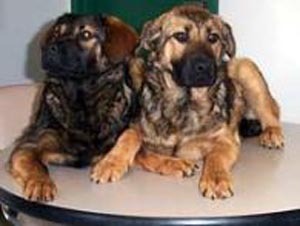 These two sisters are Lucy and Ethel. 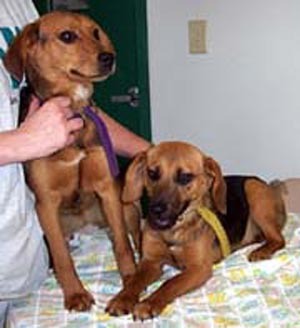 They are two 6 month old (as of 4/21) Beagles who were found roaming the countryside. They are both adorable with their soulful faces with the big brown eyes that just reel you in. Lucy and Ethel are aptly named and act like those two human females. Lucy is always finding something to get into, and Ethel is following right along. They are quite comical! They are playfulm friendly and happy. Just don't expect them to sit still very long - at least not at this age. They do NOT have to be adopted together. Please come meet our two queens of comedy. They are sure to bring a smile to your face! 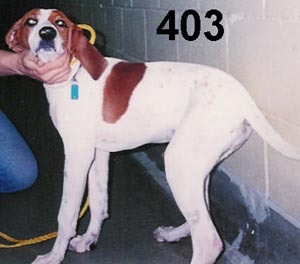 We don't have the resources to answer general inquiries about this dog until after arrival. The best way to express interest is by applying online. The application process is free. Apply here! Adoptions in progress! 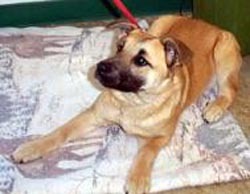 Allison is a five month old chow mix who is just the most sweet and submissive dog you'll find. Her picture does not do her justice. She is all spayed, up to date on shots, and ready for adoption. She's microchipped too. She came in with her two siblings, Zebra and Hoss, both equally wonderful. Apply here! 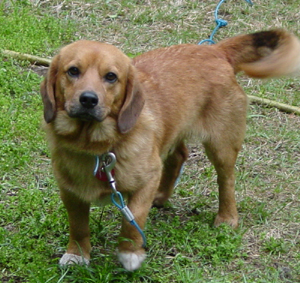 Popeye is a little beagle/corgi mix who is also from KY. He's about a year or two and is about 20 lbs. .Really cute and a very sweet temperament. 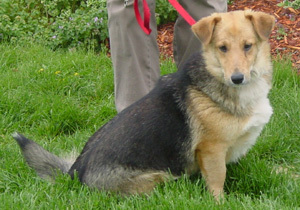 Princess is an 18 month old Shelty mix who was adopted out as a puppy. 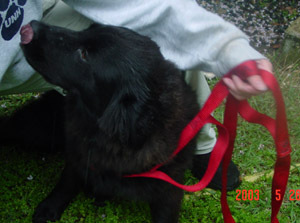 Her owner had to move to an apartment because of health problems and dogs are not welcome. 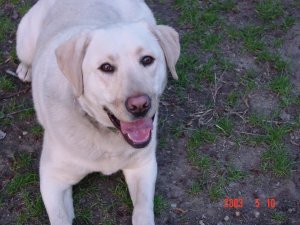 Princess was raised with an eight year old boy and was the darling of the neighborhood. She is playful and outgoing. She loves to play with toys, is not a big chewer, and loves her crate. She will need obedience work for one issue as she guards food and treats from children. The application process is free.Apply here! 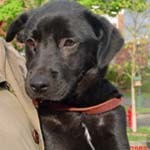 Boots is a 8 month old Labrador Retriever/Pointer mix. 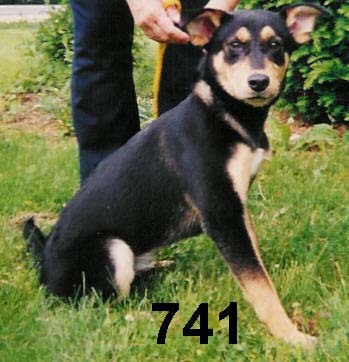 Boots is coming to Save a Dog via the PAWS shelter in Paris, KY on 5/26/03. He is medium energy and good on a leash. 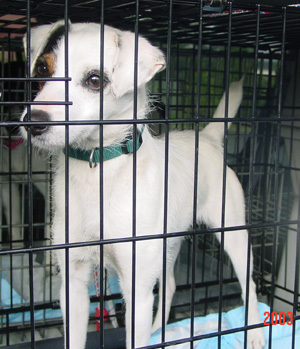 He is neutered, up to date on shots, and microchipped, thanks to Paws in Paris, KY. Apply here!